The 8-inch tablet market is full of a raft of devices to choose from, many of which double-up as laptop alternatives with keyboard dock and stylus inputs. Not so the Toshiba Encore, a full Windows 8.1 device that is just that; no additional bells and whistles to speak of. In some sense that's a good thing. If you want an affordable, usable 8-inch tablet for touchscreen-only use then the Encore has got the range. At the same time the specification fails to sing in a bustling market where the Acer W4, Asus VivoTab and many more products are already established. Can the Encore warrant its name and make us stand up and applaud it, like an A-list band at the end of a gig, or is it a middling device that's more reminiscent of elevator jazz? Visually the Encore is a tablet playing by the numbers. It doesn't really put a foot wrong in terms of its layout, yet fails to shine or innovate at the same time. The 8-inch screen is surrounded by a black bezel, with a silver-colour edge acting as a frame and adding a visual point of interest. Flip the tablet over and the rear is a plastic silver-grey shell with an embossed Toshiba logo towards the corner. It rests well in the hand thanks to a textured finish, although doesn't feel like a premium device and at 10.68mm thick it's not exactly slender. Not a surprise at this £220 price point. In addition to volume and on/off controls to the side, there's a microSD slot to the opposite side, while a micro USB, micro HDMI and 3.5mm headphone hack reside to the top. The HDMI is an unusual addition, but a cool one should you want to use the Encore to output to a screen or TV. There's 64GB of storage on board storage - 52GB of which is available - which is ample, but slip a 64GB microSD card in and that storage is more than doubled. Unlike the Microsoft Surface there's no full-size USB input which we found a little frustrating, particularly as the microUSB port would only mount to our Mac as a Removable Disc and therefore made it tricky to access files outside of cloud sharing. What we do really like about the Encore is its screen. The 1280 x 800 resolution may not sound significant - and the smaller Nexus 7 offers double the resolution - but it does the job and is well matched for viewing 720p video files. We've been watching some Boardwalk Empire while travelling by train and at this scale it looks good to us. What is most commendable about the screen, though, is the wide viewing angle. As Toshiba has used an IPS panel there's none of that frustrating contrast fall-off when the screen isn't facing directly to the eyes. Brightness is good and colours are vivid, and although reflections can occur we didn't find this to be a burgeoning issue. Adding audio to visuals there are two speakers towards the bottom of the Encore. They face downwards, which is a bit odd as they can get covered by hands, but are loud enough and deliver ample volume. At least they're not placed on the real like on some competitor models. Not that we found we used the speakers all that much: it was headphones all the way for us, which sounded loud and clear. However, we didn't find the touchscreen of our review device to always be the most responsive in use. In Windows we would often have to tap virtual buttons more than once before the press was registered - which was odd as our sideways finger-swiping always caught the device's attention. Under the hood there's an Intel Atom processor (Z3740, up to 1.86Ghz) powering things, which is ample but doesn't always result in the fastest results. We found simple tasks such as auto-rotate switching between portrait and landscape orientations to be somewhat slow, and yet when in a game sourced from Windows Store, such as Pinball FX2, everything ran just fine. Don't expect to be able to run heavyweight games though as there's not the sufficient hardware here. As this is Windows 8.1 you can install pretty much anything you should want, although many apps are now tailored for directly through the Windows Store, such as VLC player. Pre-loaded on the Encore are various bits of software, including McAfee virus protection which we found persisted in telling us how "unsafe" our use was. We didn't pay much attention as such bloatware is a nuisance. Also of note is that Microsoft Office is a trial basis only, not even the entry-level edition as found on the Asus Transformer Book T100. Unlike the aforementioned Asus there's no keyboard dock included with the Encore, although you could buy a Bluetooth one. The lack of any stylus support might also be a frustration for some. In terms of battery life we found the Encore delivered over 8-hours of varied usage that saw us through a two day weekend stint no problems. No last minute burst of energy as the name might suggest. That's not best-in-class performance, but it's none too bad either - a bit like the feeling we get from the tablet overall. The Toshiba Encore tablet lacks ambition, but also ticks enough boxes to make it a viable purchase. It just fails to excite, and with the various other options available on the market the Encore struggles to stand out. Which might sound somewhat damning, but it's not all that bad. 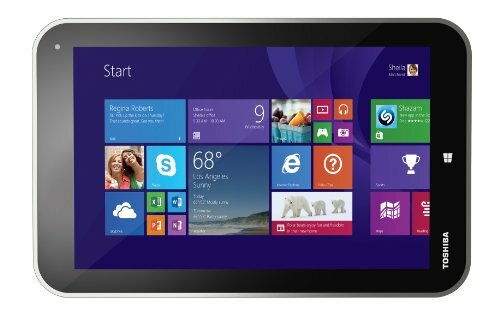 If you want an affordable Windows 8.1 device with a bright screen that delivers ample viewing angles then the Encore is a genuine option. Quirks such as a micro HDMI out and microSD slot go some way towards a point of differentiation, but the device's resolution, battery life, thickness and overall performance are all middling. Go on Toshiba, get adventurous with the next generation device rather than playing it safe and budget. We'd like more, but not more of the same like the Encore's product name might suggest. It's more elevator jazz than A-list band. Nothing wrong with that, but it is what it is.